Does the Person Heal the Horse or the Horse Heal the Person? Have you ever felt a bit overwhelmed or even sick to the stomach about not being able to solve a problem with your horse? Or even thought that there just has to be an easier way? The Healing of Pye focuses on the healing of Pye’s badly damaged back – but Pye wasn’t the only one in that partnership who was doing dramatic healing. This video shows a real life example of what I keep saying – that emotional stress causes muscular tension that pulls bones and joints out of place. And that when we REVERSE that process – i.e. fix the emotional stresses – we can and do, heal the physical problems that they caused. 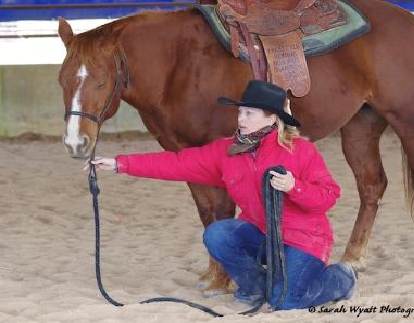 Watch Mel’s video that she produced during and after one of my online clinics and then we’ll talk about the rich, multi layered healing that took place – and of Mel’s keys to success in transforming a bucking, rearing, biting, emotionally and physically damaged horse. + Mel discovered a new level of confidence in her own abilities as she came to understand her unique feel for others as a beautiful gift, instead of the burden and problem that it had previously been. When we haven’t learned how to use our natural talent for connection, we all experience some degree of struggle. But to deeply sensitive people this can be an almost crippling burden – so recognizing and unfolding that natural talent and developing it can be an experience in freedom, delight and incredible healing. For Mel, that realization of her natural talent for connection to others, has opened up a whole new world of enjoyable life experience for her. By understanding and using her own feelings as inner guidance, she was able to help Pye and herself in transforming BOTH their lives. + The confidence that Pye developed with Mel who started to use her sensitivity for his benefit was, I believe, the biggest key to success with healing his back. The relationship and connection you have with your horse can profoundly influence the health and happiness of both you and your horse. + For Mel and Pye, taking away all the force that he had experienced previously allowed him to find a trust in Mel that cut through his chronic stress and tension that had been a significant cause of that terrible back damage. “BE the change that you want your horse to be” was a big deal for Mel in recognizing how to get him to do things without force. Mel wanted a happy relaxed horse, so she had to find a place where she was absolutely and authentically relaxed and happy herself– she WAS the change that she wanted Pye to be. And this relaxation can’t be faked, you can’t pretend and have this work – it has to be AUTHENTIC – and the process of finding that relaxation and happiness was phenomenally healing for Mel as well. 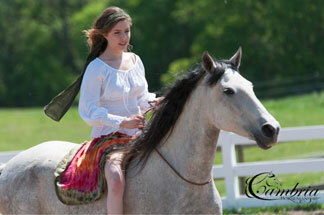 You can learn how to do that in the 9th Key to Happiness with Your Horse. + Mel systematically and conscientiously backed off at every early warning signal that something was Not Quite Right and waited for Pye to lick and Chew, yawn and RELEASE stress and tension around whatever had caused his anxiety or fear. Releasing mental and emotional stress and tension caused physical healing to happen. I’ve seen it over and over again. 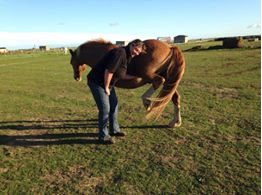 You can read about a simple yet profoundly powerful tool to do this – that anyone can use at any level of their development – in the 7th Key to Happiness with Your Horse. Did the horse heal the person or the person heal the horse? That’s a BIG question and I’d love to hear what you think about it so please leave me a comment below. I reply to all comments so I look forward to seeing you there! 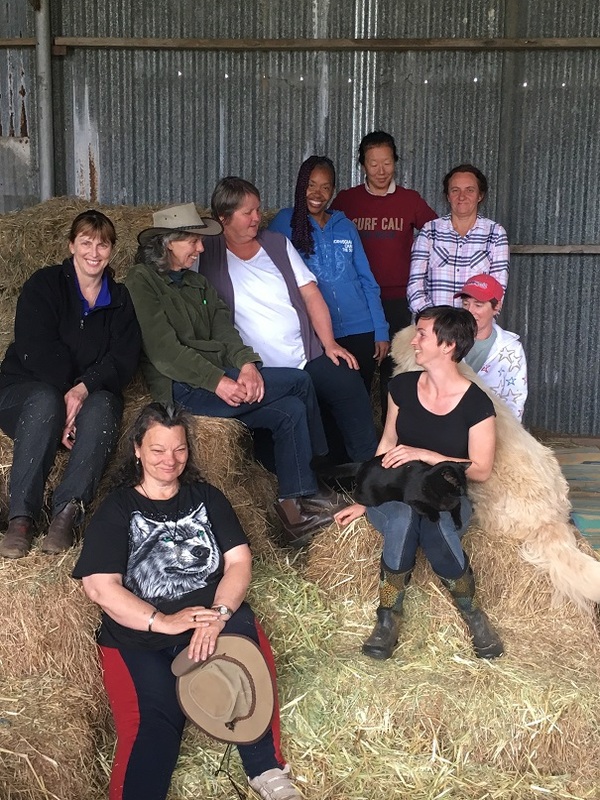 This story of Mel and Pye is the first of three stories of horse-human healing, each of which will include special insights into their journey. This series leads into introducing something that I’m VERY excited about, called Horse Magic – it could even be a world first opportunity! If you would like FREE access to the 9 Keys to Happiness with Your Horse program that I refer to in this article, get it here and use these Keys to help unlock the doors to true happiness – and healing – with your horse! Wonderful to see such healing and development of a trusting relationship. Thank you for sharing with us Mel, Pye and Jenny. It is a reawakening to the possibilities. I think it is time for me to revisit the 6/9 keys of Happiness again. Thanks Clara – I am loving the new expanded version into The Nine Keys! A big thank you to Jenny, for first her 6 keys free information option. I do suggest everyone sign up for it. The Fast Track training and of course the wonderful sessions we had as I came to understand more about the energies I was using already but didn’t realize how they could be used to the full. Love you Jenny, you are one amazing lady. Said with all my heart!! Brilliant Jenny! Of course emotions are linked to physical problems! Homeopaths have always known that! Vets and doctors are still in the dark ages as far as the cause of illness is concerned and have zero idea of the energetic process involved in healing. That kind of healing happens routinely but normally I don’t get the chance to see such vivid before and after pictures. To see such a DRAMATIC healing, documented in video was exciting hey? She did a brilliant job, didn’t she? Thank you for sharing Mel. It is so wonderful to watch! And I know how it feels! Such a deep joy and love! I think there is a lot in the words of Tom Dorrance and noe it is the second time in to days I read those words. Devony, nice to see your name! DEVONY! ! ! ! ! How WONDERFUL to see you here!!! Me thinks a Thru The Grace Of The Horse reunion might be in order…….. Very lovely of Mel to share those words to use in the editing about healing her own pain. A bit special of both of them hey? There needs to be a WARNING preface to that video at the start to move away from your keyboard before you start crying………. Oh yeah and don’t forget everyone else on the clinic. We work in an amplified field in a clinic like that, with everyone contributing beautiful energy and support to everyone else – they were magnificent! Inspirational Mel thankyou for sharing . Tears of happiness for you both. Did the horse heal the human or the human heal the horse? Wasn’t it Tom Dorrance who said …..